At the start, view the Tutorial to learn the basic gameplay. Left click to select an item or a character. From the Panel, select the action to perform with the item / character. Alternately, after selecting an item / character, scroll the mouse wheel to cycle through the action options (cannot be done if playing on a laptop with a touchpad). Finding locations on the map is almost always trial and error. Locations are revealed sequentially as events unfold. Sometimes conversation topics are added to characters already spoken to on revisiting after new events. All but two puzzles are of the inventory type. There is no intra-inventory puzzle. The inventory holds useless and already-used items, some till the end. You can also try to find new places to dock on the map. Ulysses talks to Eurylochus who then enters the Siren's Inn to join his shipmates, and is locked in. Ulysses must find a way to enter the Inn and save his crew. Take some wax from one of the two candle-skulls at the base of the steps of the Inn. INVENTORY: Use the wax with a candle-skull to melt the wax. INVENTORY: Use the melted wax with Ulysses to block his ears. The crew is rapt by the Sirens' song. Ulysses must escape before he goes mad from their song despite the wax in his ears. Walk left to the bar counter. Talk to the ghost. Learn about his hobby of building model ships. Walk to the far right of the room. Use the model ship. It breaks. Return to the ghost bartender. Tell him the model is broken. Walk into the doorway at far left to leave the Inn. Watch the cutscene with Athena. Click the raft at the left end of the jetty. Steer all the way to the left edge of the map. Dock at the Mediterranean Sea joint between Europe and Africa. Walk to the entrance of the strange building / crashed spaceship. Talk to Calypso. Ulysses must fetch the Antikythera from Libya. Move cursor around the right wall till it shows 'strange vibration'. Walk to strange vibration. It's a magic door. Take the bottle of wine and strange symbol from the left temple altar. Exit the room and office. Get back on the raft. Steer to the top coast of Africa. Dock where the north coast turns downwards towards Libya. Talk to Am Aled, the standing naked guy. Learn that the lotus flower makes everyone sleepy. Ulysses must retrieve the statue of Ptah for the Lotus-Eaters. INVENTORY: Use the strange relic with the SACRED pedestal. Ulysses wants to discuss with Am Aled first. Talk to Am Aled. Tell him you've found the relic. Am Aled gives some SACRED powder (i.e. sleep inducing lotus powder) and wine in gratitude. Use the door of the temple. MINI-GAME: The five stones in the middle have to be clicked in the right order to open the door. Three out of five is enough. This is a trial and error game; wrong clicks are harmless except for having to start over. Take the silver sphere sitting on the gears at the rear. Look at the wall mural. Look at the sun puzzle on the floor. INVENTORY: Use the sphere with the Cancer symbol of the floor puzzle. Walk Ulysses onto the Capricorn symbol of the floor puzzle. A secret compartment opens below the gears. Take the small gear device (the antikythera). Exit the chamber. Get on the raft. Talk to Calypso. Give her the Antikythera. Ulysses has to collect his gift from Calypso's hidden room. Enter the chamber via the magic door. Take the statuette sitting on the altar at left. Exit the chamber. Exit Calypso's office. Return to raft. Steer to the north side of the small island just north-east of Lotophagi. Ulysses needs to get past the he-goat in front of the cave. Get back on the raft. Dock some distance to the north on the Italian west coast. Ulysses has to make Circe something nice for dinner. Take the sleep-inducing herbs from the garden in front of the house. Take some clover from the garden at the left of the house. Return to the house. Walk in the front door. Look at the recipe on the table. The soup needs onion, celery and mushrooms from the deep. It has to be served with bread. Take the broom, rope, dish, onion, (rear shelf), celery (hanging beside rear shelf) and bread (front shelf) from around the kitchen. Ulysses needs to get the mushrooms. INVENTORY: Use the rope with the well at far left. Use the rope to enter the well. Take a mushroom from the bunch at bottom right. Return to the garden, then to the kitchen. INVENTORY: Add onion, clover, celery, mushroom and the sleep-inducing herb to the cooking pot on the fire at bottom right. INVENTORY: Use the dish with the soup-pot. INVENTORY: Use the dish with soup with the table. INVENTORY: Use the bread with the table. INVENTORY: Use the broom with the dust on the floor by the fireplace. Use the door to call Circe for dinner. Exit automatically to the garden. Take ANOTHER BUNCH of sleep-inducing herbs from the garden in front of the house. Go to the raft. Go to Cyclops. Ulysses has to feed the he-goat the sleep-inducing herbs. He needs to place the herbs on the path. For that he needs to be close to the path. This is tricky. Walk to the path (where the goat ends his walk) when the goat is nearest the mouth of the cave. INVENTORY: Use the sleep-inducing herb with the path. The goat eats the herb and falls asleep. Talk to Cyclops. Note the trident in the cave. Ulysses needs to take the trident. INVENTORY: Use the SACRED powder with the wine. Talk to Cyclops again about the best wine he's ever tasted. Exit automatically after leaving the wine beside the bed. So... that's the secret of Cyclops! Exit the cave. Go to the raft. Dock on the Italian west coast just north of Cyclops Island. Walk into the stone arch on the island where Ulysses has landed. Island 2: Walk into the left side arch. Island 3: Walk into the left side arch. Island 4: Walk into the middle arch. Aeolus wants Ulysses to tell him an interesting story in exchange for a gift. Tell him about Troy: "I pretended to be a horse..."
Tell him about Circe: "That madwoman turns men into pigs..."
Tell him about Cyclops: "I hid beneath the belly of a sheep and escaped." Telling him these stories will entertain him, but not enough. Tell him about Calypso: "She lived in a cave with other wonderful women." Exit the conversation. Aeolus is satisfied. Ulysses automatically takes a jug of wine which will control winds. Travel slightly north of Aeolia to dock at Hades. Walk into the cave at the foot of the volcano. Walk left across the bridge. Talk to the guard. He won't let any living person enter. Exit the cave. Exit to the raft. Travel slightly south of Aeolia to dock at Scylla / Charybdis. Walk right to the Scy-lah digger. Talk to the alien scientist, Karkargnor from Pyr. He needs some alien minerals to fix the Scy-lah digger. Exit to the raft. Return to Hades. Talk to the guard about bribe. Ulysses needs to retrieve the guard's charm from the Scylla. Exit to the raft. Return to Scylla. Talk to Karkargnor about the charm. He has it but does not want to give it to Ulysses. Walk left to see the magic sphere at the end of the room. Use the magic sphere. The magic flower (fan) stops turning. INVENTORY: Use the trident with the magic flower. Turn on the fan using the magic sphere (button). The trident breaks into pieces and falls into the sea. Now use the magic sphere (button) 3 – 4 times to turn the fan on and off. From the water beside the raft, take the floating piece of the trident. Talk to Karkargnor about the piece of the trident being a rod of Peusidon. Automatically give piece of trident to Karkargnor. Ask Karkargnor for reward. He gives the charm. Talk to the guard about charm. Ulysses automatically hands over the charm. Walk into the portal at right. Walk into the passage on the left. Go West, then North to find another statue beside the door. Use the statue to take the metal object part 1 in its hand. Go North, to the room with the grille. Ulysses has to open the grille. Check the mechanism in front of the grille. It's missing a lever. Enter the passage at right. Go East again to the corridor with the statue against the rear wall. Use the statue to take the metal object part 2 in its hand. Go South, South to the corridor with another statue at the corner. Use the statue to take the metal object head in its hand. Go North, North, then West, West to return to the room with the grille. INVENTORY: Combine the three parts of the objects to make the lever. INVENTORY: Use the object (lever) with the mechanism on the floor. Use the lever. The grille is open. Talk to the clairvoyant ghost Tiresias. He needs the merry-go-round fixed. INVENTORY: Use the wine jug with Tiresias – the wind will power the merry-go-round. "Those on high look at those below as the right observes the left, and in the middle, THREE." Travel east around the lower part of Italy to the western coast of Greece. Dock just north of the area where the storm prevents Ulysses from docking otherwise. Talk to Nausicaa, the queen of Atlantis and now the Phaeacians. Ulysses needs to get the Vimana working to get Nausicaa's help. Exit the room via the door at right. Walk into the beam of light at the middle of the Vimana. It teleports Ulysses into the Vimana. Look at the metal plaything at the right of the room. It is missing a part. Look at the bulge in the carpet's lower left corner. Use the bulge in the carpet to reveal an idol. Take it. INVENTORY: Use the idol with the metal plaything. 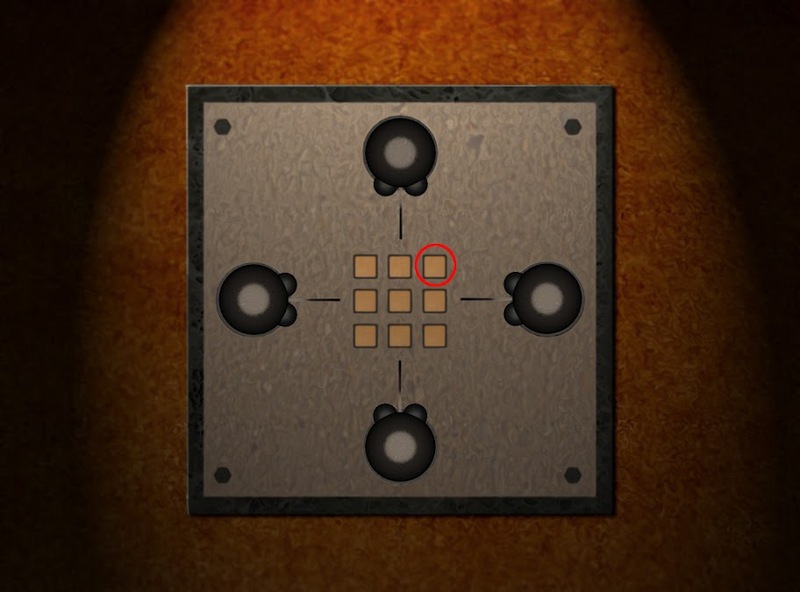 Use the completed plaything to reveal a puzzle. Walk right to the house. Take the poster of Antinous on the wall. Enter the house. Automatic conversation follows. Ulysses awakens outside the house the next morning. Walk right to the village. Talk to the guard outside the archery competition – he's hungry. Ulysses needs to get the guard some food. Walk left into the kitchen – the cook shoos Ulysses out. Walk to the right edge of the square. Talk to the woman vending the wooden horses. The woman is trying to earn money to get a husband. INVENTORY: Use the poster of Antinous with the woman. Take a toy wooden horse from the stall. Return to the entryway of the kitchen. INVENTORY: Use the wooden horse with the kitchen entrance. Take a leg of meat (raw) from the counter. Exit the kitchen. Walk left out of the village square to Eumaeus' house. INVENTORY: Use the raw meat leg with the cooking pot. Take the cooked joint of meat. Return to the village square. INVENTORY: Use the cooked joint of meat with the guard. He can't eat it now – the princes might see him. Ulysses volunteers to go inside and check out where the guards are. Enter the archery competition arena. Take the bow from the stack of bow and axes at the rear of the screen. INVENTORY: Use the bow with Antinous.